It’s that time of the year again! Yestarday started this year’s edition of the crafting event “L’aiguille en fête” at La Vilette in Paris. 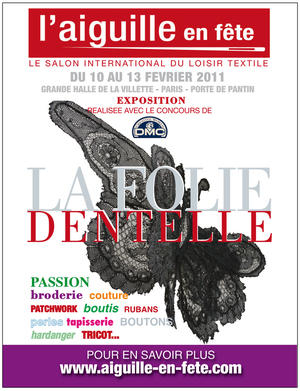 It’s an event centered around what we call in french “the needle arts” (sewing, embroidery, quilting, knitting…), with a majority of booths about quilting or embroidery. They also organize exhibitions and tutorials. This year’s theme is lace. It’s going on until this Sunday 5pm.On a more personal note our moving at the end of january went ok and we’re now in our new lovely appartment! The last room still needing unpacking and organization is, of course, the work/sewing room. ^^; No sewing for me at the moment. And we still don’t have an Internet connection, although we’re supposed to. Hence the lack of posts here. I’m trying to post this through an application on my phone, I hope it will work. We called the company in charge this morning, they will try to find out what’s happening and hopefully we should have access to the Internet within two weeks (fingers crossed! ).